It’s Mental Health Awareness Week, and one local organization is making access to care more affordable for those seeking therapy. WASHINGTON — Nearly a decade after Elizabeth Johnsen was diagnosed with bipolar disorder, she decided to try therapy. “I had never been consistent with any type of therapy before, and I kind of woke up one day and realized I better listen to him,” said Johnsen, who lived in Vienna, Virginia, at the time. But first, there were a few obstacles to overcome. One was the cost of counseling. Therapy is expensive, with some hourlong sessions totaling upward of $200. Because of this, Johnsen knew the frequency with which she could access care was limited. Then, someone told her about The Women’s Center. Founded in 1974, The Women’s Center is a nonprofit organization that provides mental health counseling and support to thousands of people each year from its locations in Vienna, Virginia, and Washington, D.C. Unlike most therapy offices, The Women’s Center operates on a sliding-scale payment system, making care more affordable, and thus more accessible. 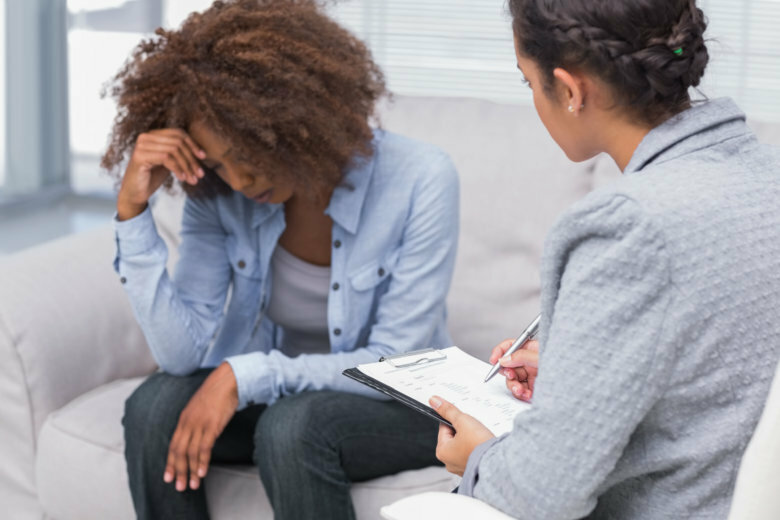 Shirley Clark, executive director and CEO of The Women’s Center, said a typical session with one of the center’s 65 therapists costs between $22 and $60 an hour. For Johnsen, this steep discount made all the difference. She was able to seek the counseling she needed, sometimes multiple times a week. “And (I was able to) really work on the issues that I need to work on to be stable and balanced and well,” Johnsen said. According to the National Alliance on Mental Illness (NAMI), one in five Americans is affected by mental health conditions, but estimates suggest only half of people with mental illnesses receive treatment. The cost of care is one deterrent to treatment, but so is the stigma that surrounds mental health — another hurdle that delayed Johnsen’s decision to seek therapy. NAMI calls stigma “toxic” to those affected by mental health conditions because “it creates an environment of shame, fear and silence that prevents many people from seeking help.” Lack of treatment for serious mental illness costs the U.S. $193.2 billion in lost earnings each year, NAMI reports. Johnsen said her “biggest fear” about seeking therapy and going public with her bipolar diagnosis was that she’d lose friends and business clients. “When you find out that you suffer from some kind of a mental illness, people want to withdraw, they don’t want to tell anybody, it’s really a big secret … and it’s in silence that people suffer,” said Johnsen, whose mother and brother also struggled with mental illness. Johnsen, who recently moved to Florida, attended therapy at The Women’s Center for several years. She is still in therapy and keeps in touch with her Virginia-based therapist via phone calls, FaceTime and in-person visits. Over the years, Clark has heard many success stories similar to Johnsen’s. She has also seen more members of the community come to The Women’s Center (which, despite its name, also treats men and children), and attributes the trend to the public gradually “getting over the stigma” that has haunted mental health for so long. She wants others to know that taking care of one’s mental health is just as important, and should be just as routine, as taking care of one’s physical health. “You need a checkup now and then. You need to know what makes you healthy and understand how your brain works. And many people don’t know that and could benefit greatly by learning a few things,” Clark said. Johnsen calls the therapy she received at The Women’s Center “a lifesaver,” and urges anyone considering counseling or struggling with mental illness to go sooner rather than later. “If you’re afraid, I understand. I spent my life afraid, but there is help out there. I know it’s scary, but once you’re there, once you have that therapist and you’re willing to work on yourself or whatever situation you have, to me, there’s no option not to,” Johnsen said. The Women’s Center offers counseling for individuals, families and couples. You can find more information and make an appointment on the center’s website. On Oct. 13, The Women’s Center will host its annual gala to raise funds to support its services. Tickets are available online. Mental Health Awareness Week is Oct. 7-13. This year’s theme is “CureStigma.” Information and resources are available on NAMI’s website.